Crisp romaine lettuce tossed in a classic Caesar dressing and covered in homemade croutons. Grilled chicken breast, bleu cheese crumbles, crispy bacon, egg, and black olives. Grilled chicken, mixed greens, cheddar cheese, cucumber and tossed coconut. A grilled chicken breast, seasoned with cajun spices piled on a fresh salad. Cheddar cheese, cucumbers, and black olives top this item. Fresh grilled chicken breast, artichoke hearts, mixed greens, black olives, sliced cucumber, and mozzarella cheese. A generous slice of homemade quiche served with a garden salad. Ask your server for today's selection. 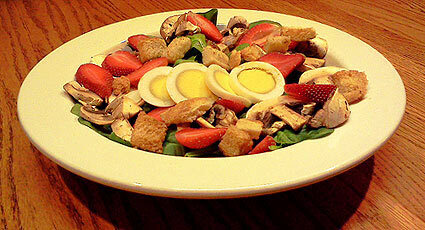 Crispy fresh spinach leaves covered with sliced strawberries and mushrooms, hard-boiled egg and croutons. Boneless spicy buffalo chicken strips, crumbled bleu cheese, mixed greens, black olives, and cucumber. Crisp salad topped with fresh ham, tom turkey, Monterrey Jack and sharp cheddar cheese. Black olives, mushrooms, egg and real bacon top this treat.